SAN JOSE, Calif.--(BUSINESS WIRE)--Cypress Semiconductor Corp. (NASDAQ: CY), the embedded solutions leader, announced that it has expanded its collaboration with Arm to enable secure, easy-to-use management of Internet of Things (IoT) edge nodes based on Cypress’ leading compute and connectivity hardware. The solution integrates the Arm® Pelion™ IoT Platform with Cypress’ ultra-low power, dual-core PSoC® 6 microcontrollers (MCUs) and CYW4343W Wi-Fi® and Bluetooth® combo radios for robust wireless connectivity. PSoC 6 provides Arm v7-M hardware-based security that adheres to the highest level of device protection defined by the Arm Platform Security Architecture (PSA). PSoC 6 is the industry’s lowest power, most flexible MCU with built-in Bluetooth Low Energy (BLE) wireless connectivity and integrated hardware-based security in a single device. The PSoC 6 architecture is built on ultra-low-power 40-nm process technology, and the MCUs feature low-power design techniques to extend battery life up to a full week for wearables. The dual-core Arm Cortex-M4 and Cortex-M0+ architecture lets designers optimize for power and performance simultaneously. Using its dual cores combined with configurable memory and peripheral protection units, the PSoC 6 MCU delivers the highest level of protection defined by the Platform Security Architecture (PSA) from Arm. Designers can use the MCU’s software-defined peripherals to create custom analog front-ends (AFEs) or digital interfaces for innovative system components such as electronic-ink displays. The PSoC 6 MCU features the latest generation of Cypress’ industry-leading CapSense® capacitive-sensing technology, enabling modern touch and gesture-based interfaces that are robust and reliable. Designers can find more information on the PSoC 6 MCU architecture at http://www.cypress.com/PSoC6. Cypress is the leader in advanced embedded system solutions for the world’s most innovative automotive, industrial, smart home appliances, consumer electronics and medical products. Cypress’ microcontrollers, analog ICs, wireless and USB-based connectivity solutions and reliable, high-performance memories help engineers design differentiated products and get them to market first. Cypress is committed to providing customers with the best support and development resources on the planet enabling them to disrupt markets by creating new product categories in record time. To learn more, go to www.cypress.com. Cypress, the Cypress logo, PSoC and CapSense are registered trademarks of Cypress Semiconductor Corp. All other trademarks are property of their owners. 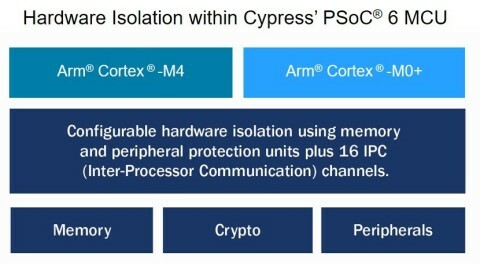 Cypress Semiconductor has expanded its collaboration with Arm to enable secure, easy-to-use management of IoT edge nodes based on Cypress' PSoC 6 MCU.